Trail running is a unique sport that attracts newbie and veteran runners alike. This style of running gets athletes out in nature doing a high-impact activity that simultaneously burns calories and invigorates the spirit. At first it can seem like any running shoe will do the job for trail running, but the truth is that there’s a whole world of carefully designed trail running shoes that were made to make trail runs comfortable and enjoyable. This article will guide you through the most important things to know about what makes a good trail running shoe and will cite some of the best trail running shoes for women in 2019. Are your feet wide? Narrower than average? Do you have long toes or thin ankles? When trying on trail running shoes, it’s important the shoes are comfortably snug; not too tight and not too loose. This ensures stability and support as well as comfort. As a rule, choose shoes that have a thumb’s width of space at the toe when they’re fully laced. A wider toe box may be important for individuals with wide feet or certain foot problems, but it can also be important for people with average feet. Usually, lighter shoes are better. This makes shoes more responsive and a lighter shoe minimizes fatigue and the chance for injury. Some shoes may feel heavy while other shoes may feel lighter, but aim to find a shoe lighter than 12 oz. Pay close attention to shoe weight when testing out trail running shoes in person at a shoe store. Some people prefer lighter shoes while others prefer shoes that are a bit heavier; determine your personal preference ahead of time based on past experience. The drop from the heel to the toe of the shoe is measured in millimeters and can be anywhere from 0mm – 12mm. The amount of heel-to-toe drop is a crucial element to consider; the decision can be based on personal preference and knowledge of individual running form. Some people do better wearing flat shoes, while other people may need to have shoes with a high heel-to-toe drop. If you’re buying your first pair of running shoes and are unsure about what is right for you, ask a specialist of qualified shoe store employee for assistance and advice. The tongue of the shoe is often overlooked by runners who are trying on shoes in the store, but it’s a vital part of the shoe to examine in terms of comfort and stability. Individuals who want more support from their shoe may need a particular style of tongue, while other people may not need as much stability. Additionally, because of foot shape or running form certain designs are uncomfortable for some women, so pay close attention to the tongue. Give running and walking a shot while you’re wearing the trail running shoes at the store. This will help you identify any issues with fit ahead of time before you make a final purchase, thus saving you time and energy later on down the road. Stack height has to do with the amount of material layered on the bottom of the shoe to either protect or expose the feet to the running terrain during a workout. Different people have different opinions about the “correct” stack height, so this is mostly up to the runner to decide. A shoe with a thicker stack height will provide more protection from rough terrain. Women with particularly sensitive feet or certain types of injuries or foot conditions may benefit most from trail running shoes that have thicker stack heights. Some running shoes have little to no stack height, meaning it’s possible to feel the details of the ground under your feet easily while running. Some people may enjoy the “barefoot feel” that these shoes provide, while other people may prefer a thicker sole. Lug length is an important aspect of trail running shoes to examine. This has to do with how well the shoes can navigate slippery or rough terrain during a run. Before buying, consider the type of terrain you’ll be running so you can make a good choice. Trails that are made up of stones and dry dirt are best attacked with a pair of trail running shoes that have a short lug pattern. In contrast, muddy, slippery trails or trails with softer ground should be approached with shoes that have a deeper, longer lug pattern. If you’re planning to run trails that have sharp, rocky terrain, it’s important to decide whether you’d prefer foam or a rock plate. Some individuals may do better with foam, while other people may choose to buy shoes with a rock plate. This is a matter of personal preference. Foam provides stability, support, and shock absorption, making it a good choice for people with high arches or flat feet. For trail running, women with specific foot conditions may prefer foam because of its supportive qualities and overall comfort. In contrast, a rock plate is a hard, thin plastic layer built into the soles of the shoes to minimize discomfort and to provide a barrier between sharp rocks and the tender soles of the feet. Shoes with rock plates usually offer a more natural-feeling gait and better foot placement. Before making any trail running shoe purchase, consider the way that you plan to use the shoes. This is important to help you make good decisions regarding things like lug length and stack height, among other decisions. Do you plan to run on well-trodden trails that are relatively flat, or do you want to run on mountain paths that have lots of rocks? Are you a serious runner or do you run casually and irregularly? These are important questions to ask before making a final decision. After you’ve considered your personal situation, real online reviews and try on the shoes yourself to determine which pair of trail running shoes is right for you. Salomon is a popular name in the running shoe industry. In its Sense Ride shoe, Salomon has produced a high-quality trail running shoe perfect for all your runs over even the most difficult, slippery, and uneven terrain. These trail running shoes are very light at only 8.8oz. But don’t be fooled, the Salomon Sense Ride shoes also have a 27mm stack height that offers plenty of protection from sharp rocks on trails and a little extra distance from puddles and mud. Salomon designed these shoes to have easily securable quick laces that minimize problems caused by laces that come undone regularly. Plus, the upper of the shoe is made of breathable mesh material that reduces the possibility of blisters and excessive heat and overall discomfort. 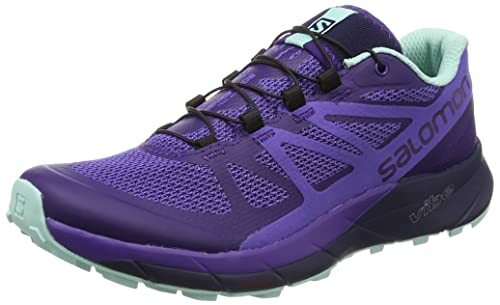 The Salomon Sense Ride trail running shoes are durable and long lasting. They can handle a variety of different terrains effectively and are fully capable of managing long distance runs in nature. 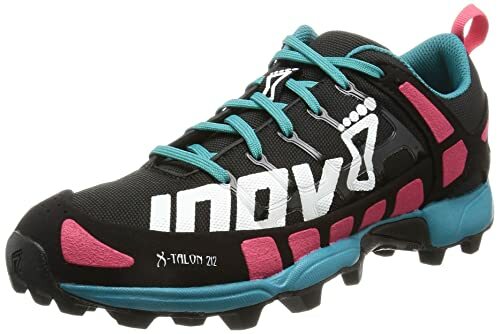 These shoes are extraordinarily diverse and multifunctional, with a beautiful design and truly “inov-8-ive” features, the X-Talon 212 shoes from Inov-8 are some of the absolute best trail running shoes for women in 2019. The X-Talon 212s are lightweight and flexible. In fact, they can even be bent and twisted with only your bare hands! Because of these features, these shoes are highly responsive and conform with each and every move you make, even on the most difficult trails. A 6mm insole with an EVA foam midsole provides plenty of protection from the elements during trail running. Plus, the cleats of the X-Talon 212 shoe are deep and good for having plenty of grip on all different kinds of terrain so that you can focus more on your surroundings. Designed with a pull loop and super lightweight materials means it’s possible to easily incorporate hiking into a trail running/hiking adventure. These shoes are capable of handling almost anything as long as they’re taken care of properly. 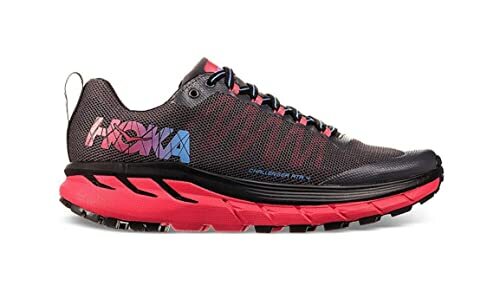 Hoka One One is an up and coming shoe company that produces unique running shoes for individuals with all different types of feet who enjoy all different kinds of running, including trail running. The Challenger ATR 4 shoe is superb as a trail running shoe for dedicated runners. These shoes are particularly well suited to runners with special foot conditions. The extra padding and foam midsole in the Challenger ATR 4 shoes makes the shoe one of the most comfortable trail running shoes of 2019, and also one of the most supportive. The Challenger ATR 4 shoe’s shape is unique with a rocker design and a comparatively low 5mm drop. Some runners may find this shape takes some getting used to, but many trail runners discover they love the innovative design after the break in period is finished. The upper of these shoes is made from a breathable mesh. But, as a trail running shoe, the Challenger ATR 4 also comes equipped with a toe guard that protects toes from sharp rocks, sticks, and other natural elements. Although Altra is a lesser known brand, that doesn’t mean they don’t make spectacular running shoes. The King MT 1.5 trail running shoe was carefully designed to be able to handle muddy, wet terrain with ease and grace; it’s an excellent choice for trail running in rainy climates. Vibram-style lugs on the bottom of these shoes ensures a stable and secure grip on loose or wet earth. The foot-shaped lugs of this design mimic the way that bare feet naturally hit the ground without any support from shoes. Additionally, this makes the shoes highly responsive. One of the unique features of the Altra King MT 1.5 is the Velcro strap situated on the upper of the shoe over the top of the laces. This strap increases the stability of the shoe while also securing the laces so that they don’t come undone during an intense trail run. These shoes have a Zero Drop platform, so they’re completely flat with no difference between the height of the heel and the height of the toes. The lugs position the whole shoe 6mm off the ground, and the StoneGuard rock plate protects feet from stones and sticks while on the road. Saucony offers some of the best running shoes on the market. 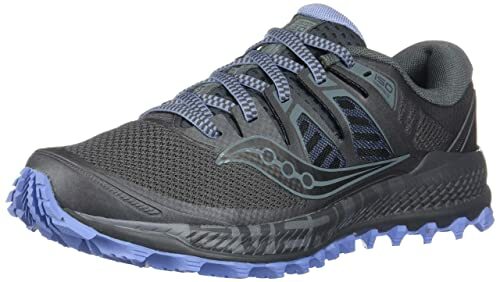 In 2019, Saucony is offering women runners the Peregrine ISO trail running shoe as a versatile and dynamic solution to handling complex and difficult nature paths. The Peregrine ISO trail running shoes are lauded for all of their brilliant comfort, durability, and traction related features. In addition, these shoes have an exceptional fit, with many customers noting that the shoes are true to size and have a perfect fit. As one of the heavier shoes on this list at 10.5oz, the Peregrine ISO shoes are sometimes called bulky, but their additional cushioning and protective features make the extra weight worth it. The shoes have a 4mm drop, making them nearly flat but with just enough lift to be protective. These shoes offer an innovative lacing system called ISOFit that provides a snug fit that ensures support and stability. The heel collar of the Peregrine ISO shoes has extra padding, something that some runners love and others find bothersome; try the shoes on before buying. The Topo Athletic Ultraventure shoe has one of the tallest stack heights of any of the trail running shoes on this list at 30mm and 25mm (featuring a 5mm heel-to-toe drop). This is crucial however, as the shoe doesn’t have a rock plate to protect from sharp, rocky terrain. These shoes provide extra cushioning, including an EVA midsole that offers support and comfort during long, complicated trail runs. A wide toe box makes these shoes stand out among the rest and gives them an advantage in terms of breathability and overall comfort and stability. 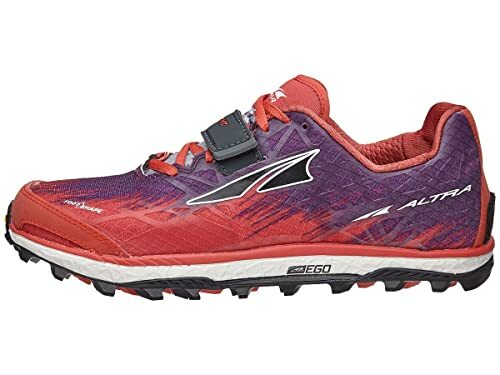 Like the Altra King MT shoes, the Topo Athletic Ultraventure trail running shoes feature a Vibram-style lug design that is tough and solid, perfectly capable of handling all types of natural terrain. The 6mm high lugs keep the shoes adequately off the ground to minimize discomfort. 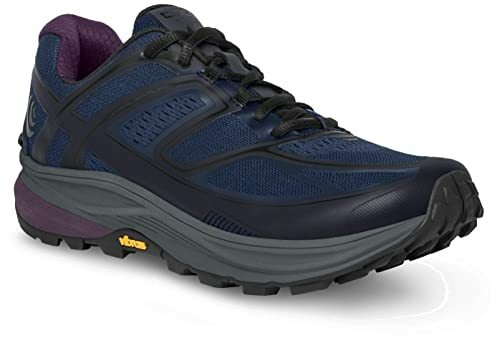 Because these shoes only have foam to protect feet from the elements (and no rock plate), the Ultraventure shoes may not be the best choice for particularly rough trails. However, they’re an ideal choice for moderately difficult trails and offroad running workouts. 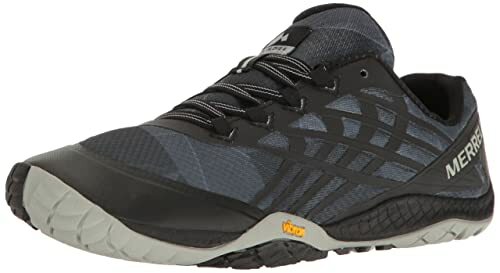 These trail running shoes are specifically well suited for trail running and hiking on less intense trails and natural paths. As one of the more lightweight shoes on this list at 8oz, these shoes are ideal for runners that prefer a more responsive shoe design. 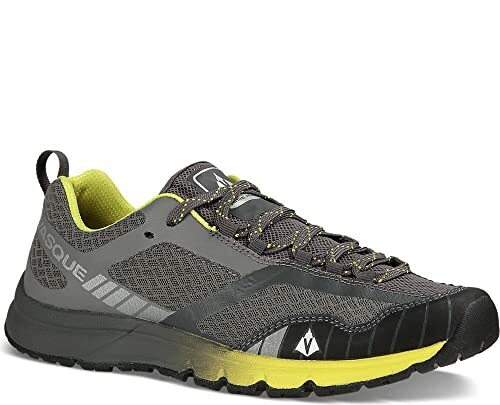 Vasque Vertical Velocity shoes have a wide toe box, making it easy for runners and hikers to spread out their toes during exercise for maximum stability and comfort. In addition, a 4mm heel-to-toe drop provides forefoot strikers with a comfortable yet minimal shoe design. A sock-like fit means that the Vertical Velocity shoes are good for runners with high arches and flat feet. These shoes provide runners and hikers with dynamic support that goes with them on every mile of their hike or jog. Because these shoes have a lighter lug pattern, they aren’t as well suited to complicated, slick, or rocky trails. The Vertical Velocity shoes have excellent grip, but because the lugs are shallower the grip isn’t as good as other shoes specifically designed for intense trails. Merrell is classically known for its wonderfully designed hiking boots and shoes, so it’s only logical that the company would design a shoe just for trail running. The Merrell Trail Glove 4 lives up to the brand’s quality and popular reputation in the athletic world. Rather unique in its design, the Trail Glove 4 features a flat 0mm drop that replicates the way that running feels and affects the body when running barefoot. This shoe is one of the shoes making way in the ever-growing number of “minimalist” running shoes. The Merrell Trail Glove 4 shoes have a thinner sole that lets the runner feel the terrain as the run so that they can make adjustments quickly and effectively. Meanwhile, a Trail Protect pad ensures that runners’ feet are adequately protected as the traverse natural terrain. A Vibram outsole increases the natural stride and fit of these trail running shoes. But potential customers should be aware that these shoes have somewhat unusual sizing, and therefore it’s absolutely vital to try the shoes on before buying to ensure a good fit. 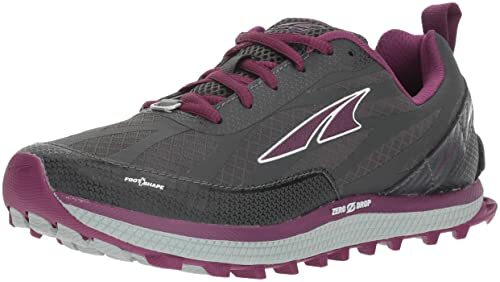 Yet another minimalist shoe with a 0mm drop, the Altra Superior 3.5 trail running shoes were designed to be highly responsive so they could adapt to every move made along the trail. The shoes “look like a foot”, and have an appealing design for all different aesthetic tastes. The Altra Superior 3.5 trail running shoes also have a wide toe box in addition to its minimalist design. This encourages the runner’s toes to spread out during runs, thus providing extra support and stability naturally without any unnecessary features. These shoes have 21mm of cushioning below foot, making them one of the less cushioned shoes on this list, but still with just enough padding to support tender feet during a run over rocky terrain. Plus, the StoneGround rock plate helps keep sharp rocks and sticks at bay. Just like the other Altra shoe on this list, the Altra King MT 1.5, this shoe has Fit4Her technology. This means that the shoe is created to suit the female foot. Women’s feet are built differently, so this special design means that women runners can focus more easily on their run. The last trail running shoe on this list is another minimalist running shoe with a 0mm drop. This flat design allows the runner to be adaptive and responsive to technical terrain. Topo’s Athletic Runventure 2 trail running shoe gives fans of the brand a mainstream running shoe option. A breathable, mesh upper shoe in the Athletic Runventure 2 shoe keeps feet dry even in the hottest of conditions. This is an absolutely vital feature of a trail running shoe, and Topo has been highly successful in designing a comfortable and versatile shoe. The Athletic Runventure 2 shoe has minimal cushioning and stack height, but the ESS rock plate built into the shoe keeps feet well protected during runs over rocky terrain. Plus, the shoe comes in at one of the lightest on this list at only 7.4oz! Besides their comfortable and supportive design, the Topo Athletic Runventure 2 shoes are aesthetically pleasing with multiple attractive color options. 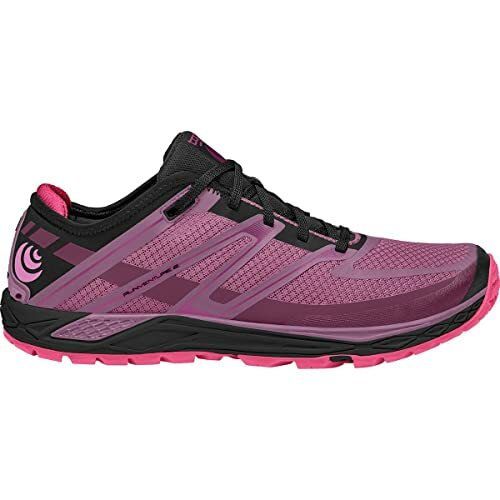 Female trail runners will adore the style options and comfort that these shoes offer. Q: How are trail running shoes different than regular running shoes? 1. Outsole – The outsole of trail running shoes (the bottom of the shoes) has special “lugs” that help runners maintain grip and stability while running on uneven ground. Most trail running shoes utilize rubber outsoles with lugs to protect your feet during a run. 2. Upper shoe – Trail running shoes have upper shoe portions that combine water resistant materials with breathable fabrics. In contrast, regular road running shoes might not have waterproof materials built in to the upper portion. 3. Midsole – Road running shoes usually have foam midsoles, which trail running shoes also have. But, in addition to foam, some trail running shoes may have a rock plate that protects from sharp rocks and provides stability. 4. Heel-to-toe drop – Trail running shoes generally have a lower drop than regular road running shoes. This is because trail runners need to be able to quickly adapt stride and heel strike during runs without any interference. In summary, trail running shoes are constructed to give runners extra protection and the ability to adapt effectively at all times. Unique design features provide runners with the tiny details necessary to have a comfortable and safe run in nature. Q: Is there a higher risk of injury with trail running than with regular running? The answer to this question will be different depending on who you ask. Some individuals believe that trail running is actually better for your body and that it can enhance your athleticism, while other people may raise the argument that the risk of falling or twisting an ankle is higher. People with flat feet or high arches (or other foot-related conditions that require extra stability) will need to consider support and stability aspects of the shoes and other equipment they buy to ensure their feet are properly situated as they run along uneven trails. As with any sport, both road running and trail running can be dangerous if approached without the appropriate amount of caution. If you have doubts about the safety of trail running, ask a physical therapist or another medical or athletic professional for guidance and advice. Q: Can you use trail running shoes for road running too? What about using regular running shoes for trail running? Yes, trail running shoes can usually be safely used for road running. Although trail running shoes are calibrated to handle rough terrain, this doesn’t mean they’re not capable of also handling road conditions in certain conditions. Technically it’s also possible to use regular running shoes for trail running, but it may result in some discomfort and a higher potential for injury. Trail running is a specialized sport, and it’s important to invest in the right equipment so that you can have the best experience. The final assessment of this question is that despite the fact that it’s possible to use either type of shoe for either type of running, if you know you’ll be doing more of one or the other (trail or road running), it’s smart to invest in the right pair of shoes for the job. Trail running is a fantastic and beautiful athletic endeavor that any runner, beginner or advanced, can thoroughly enjoy. Investing in a pair of quality running shoes will ensure that your workouts are safe, effective, and relaxing so that you can focus on the surroundings passing by.